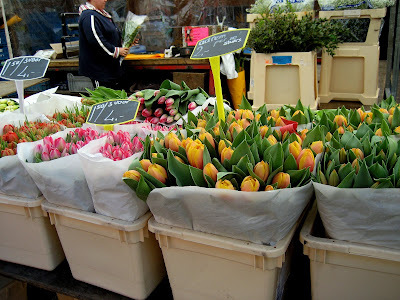 Have you ever wondered why a flower costs that costs 50 cents today costs 5 EUR on Valentine’s day? 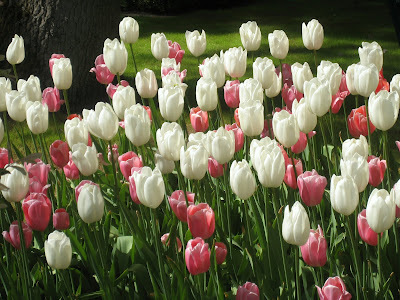 Why roses cost more than tulips (below), or why tulips cost more than gerberas? Simple matter of supply and demand, you would say. But who sets these prices? How? When? Where? 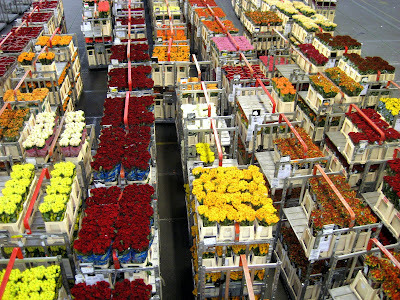 Last week, we drove to the Aalsmeer flower auction house (below)- Bloemenveiling Aalsmeer – the largest commercial building in the world, covering a size of 1 million sq.m or 200 football fields. 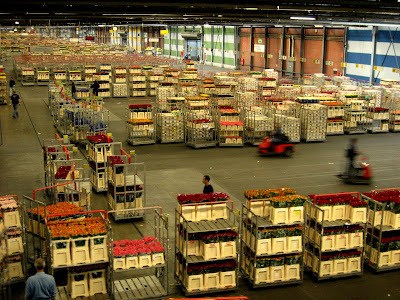 Every day, millions of flowers and cut plans are brought to Aalsmeer, where it is auctioned off to potential buyers all over the world, thus setting the price of flowers and effectively making it the wall street of flower trade. A visit to the flower auction would be a joy to flower lovers as well as to any business aficionado. The auction house (below) traces its origins to as early as 1911, when the growers came together in response to the growing power of intermediaries, and the first ‘export flowers’ were auctioned at cafÃ© Welkom in Aalsmeer. 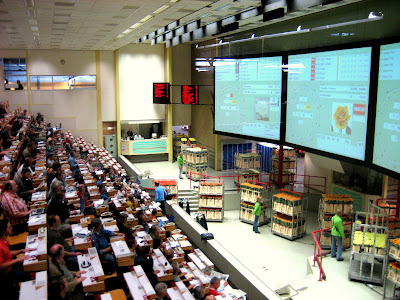 Today, the Bloemenveiling Aalsmeer boasts a an average daily turnover of 6.6 million Euros, with about 60,000 clock transactions every morning. The five auction rooms (below), which together house 13 auction clocks form the heart of the Bloemenveiling. The price is determined by the Dutch auction system – the first buyer to press the button not only determines the price, but buys the batch at the same time. Every day, the same products are brought into the clock room to be auctioned in front of the clock. 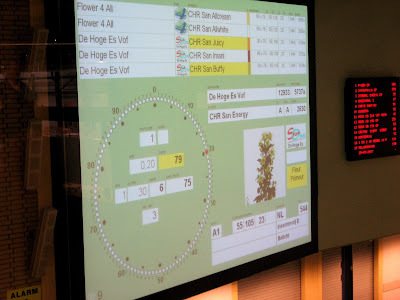 Based on the information they see on the clock face (below), they have to make a quick decision on how much they would want to buy and at what price – not an easy task, especially since it is all done by 7:00am, before most of us would have had our morning coffee. This gives enough time for the flowers to reach buyers all over the world, while they are still fresh. 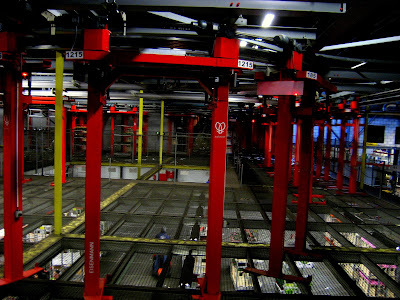 Aalsmeer boasts a state-of-the-art logistics – the Aalsmeer shuttle (below) is a unique and efficient electrically operated suspended rail system that transports the equivalent of 120 full freight trucks every hour. The various buyers then deliver the flowers to their end customers – be it a supermarket in Germany or a boutique shop in London or a garden in Moscow or a chic shop in Tokyo or the famous flower markets of Amsterdam (below), before it makes its way into our flower vases, to brighten up our home. Who would have imagined the complex journey each flower has made before it reaches our homes? I think I would I would love visiting such a place!